**We recommend bringing your own small bucket with water to keep your flowers hydrated on the ride home. The bucket can stay in the car. 1. Grab a picking basket. 2. When you find a gladiola you want, reach down as close to the soil level as possible, grasp the stem and pull straight up. 3. You may get a flower bulb, or you may not. 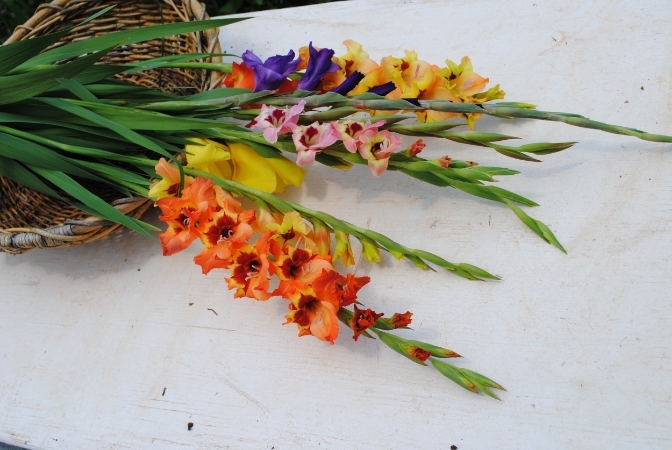 Either way, gladiolus are $1 per stem. Pick only what you intend to purchase. 4. When you're finished picking, head to our self-serve processing station. If you need assistance, a staff member should be close by. 5. Cut the bulbs off. Use the rubber bands provided on the processing tables and count your stems as you band them together. 6. Proceed to the checkout counter and please remember to return your snips and picking basket. 7. Trim 1/4 inch off of the ends when you get home and place the flowers in clean water. Change the water every three days or so for a long lasting bouquet. We'll see you in the flower fields!